Acquired by Novafora, patent portfolio sold to Intellectual Ventures. Transmeta Corporation was an American fabless semiconductor company based in Santa Clara, California. It developed low power x86 compatible microprocessors based on a VLIW core and a software layer called Code Morphing Software. Code Morphing Software consisted of an interpreter, a runtime system and a dynamic binary translator. x86 instructions were first interpreted one instruction at a time and profiled, then depending upon the frequency of execution of a code block, CMS would progressively generate more optimized translations. The VLIW core implemented features specifically designed to accelerate CMS and translations. Among the features were support for general speculation, detection of memory aliasing and detection of self modifying x86 code. The combination of CMS and the VLIW core allowed for the achievement of full x86 compatibility while maintaining performance and reducing power consumption. Transmeta was founded in 1995 by Bob Cmelik, Dave Ditzel, Colin Hunter, Ed Kelly, Doug Laird, Malcolm Wing and Greg Zyner. Its first product, the Crusoe processor, was launched on January 19, 2000. Transmeta went public on November 7, 2000. On October 14, 2003, it launched its second major product, the Efficeon processor. In 2005, Transmeta increased its focus on licensing its portfolio of microprocessor and semiconductor technologies. After layoffs in 2007, Transmeta made a complete shift away from semiconductor production to IP licensing. In January 2009, the company was acquired by Novafora and the patent portfolio was sold to Intellectual Ventures. Novafora ceased operations in August 2009. Intellectual Ventures licenses the Transmeta IP to other companies on a non-exclusive basis. Transmeta produced two x86 compatible CPU architectures: Crusoe and Efficeon – internal code names were 'Fred' and 'Astro'. These CPUs have appeared in subnotebooks, notebooks, desktops, blade servers, tablet PCs, a personal cluster computer, and a silent desktop, where low power consumption and heat dissipation are of primary importance. Before the 2009 acquisition by Novafora, Transmeta had moderate success licensing its IP. Licensors for Transmeta technology are Intel (with a perpetual, non-exclusive license to all Transmeta patents and patent applications, including any that Transmeta might acquire before December 31, 2017), Nvidia (with non-exclusive license to Transmeta’s LongRun and LongRun2 technologies and other intellectual property), Sony (LongRun2 licensee), Fujitsu (LongRun2 licensee) and NEC (LongRun2 licensee). Founded in 1995, Transmeta began as a stealth start-up. The company was largely successful in hiding its ambitions until its official company launch on January 19, 2000. Over 2000 non-disclosure agreements (NDAs) were signed during the stealth period. Throughout Transmeta's first few years, little was known about exactly what it would be offering. Its web site went online in mid 1997 and for approximately two and a half years displayed nothing but the text, "This web page is not yet here." Yes, there is a secret message, and this is it: Transmeta's policy has been to remain silent about its plans until it had something to demonstrate to the world. On January 19, 2000, Transmeta is going to announce and demonstrate what Crusoe processors can do. Simultaneously, all of the details will go up on this Web site for everyone on the Internet to see. Crusoe will be cool hardware and software for mobile applications. Crusoe will be unconventional, which is why we wanted to let you know in advance to come look at the entire Web site in January, so that you can get the full story and have access to all of the real details as soon as they are available. Transmeta attempted to staff the company in secret although speculation online was not uncommon. Information gradually came out of the company suggesting it was working on a very long instruction word (VLIW) design that translated x86 code into its own native VLIW code. On January 19, 2000, Transmeta held a launch event at Villa Montalvo in Saratoga, California and announced to the world that it had been working on an x86 compatible dynamic binary translation processor named Crusoe. It also released an 18-page whitepaper describing the technology. Transmeta marketed their microprocessor technology as extraordinarily innovative and revolutionary in the low-power market segment. They had hoped to be both power and performance leaders in the x86 space but initial reviews of Crusoe indicated the performance fell significantly short of projections. Also, during Crusoe development Intel and AMD significantly ramped up speeds and began to address increasing concerns about power consumption. So Crusoe was rapidly cornered into a low-volume, small form factor (SFF), low-power segment of the market. The company had its first layoffs in July 2002, reducing the headcount of the company by 40%. On October 14, 2003, Transmeta announced the Efficeon processor which was claimed to have twice the performance of the original Crusoe CPU at the same frequency. However, performance was still weak relative to the competition and the complexity of the chip had increased significantly. The greater size and power consumption may have diluted a key market advantage Transmeta's chips had previously enjoyed over the competition. In January 2005, the company announced its first strategic restructuring away from being a semiconductor product company and began to focus on licensing intellectual property. In March 2005, Transmeta announced that it was laying off 68 people while retaining 208 employees. Sony was reported to be a key licensee of Transmeta technology and approximately half of the remaining employees were to work on LongRun2 power optimization technology for Sony. On May 31, 2005, Transmeta announced the signing of asset purchase and license agreements with Hong Kong’s Culture.com Technology Limited. The deal fell apart due to delays in obtaining technology export licenses from the US Department of Commerce and the parties announced the termination of the agreements on February 9, 2006. On August 10, 2005, Transmeta announced its first-ever profitable quarter. This was followed by GameSpot’s March 20, 2006 report that Transmeta was working on an “unnamed” Microsoft project. As it turned out, this was a secure platform under the AMD brand for Microsoft’s FlexGo program. On October 11, 2006, Transmeta announced that they had filed a lawsuit against Intel Corporation for infringement of ten Transmeta U.S. patents covering computer architecture and power efficiency technologies. The complaint charged that Intel had infringed and was infringing Transmeta's patents by making and selling a variety of microprocessor products, including at least Intel's Pentium III, Pentium 4, Pentium M, Core and Core 2 product line. On February 7, 2007, Transmeta shutdown its engineering services division terminating 75 employees in the process. This was concurrent with an announcement that the company would no longer develop and sell hardware and would focus on the development and licensing of intellectual property. Subsequently, AMD invested $7.5 million in Transmeta, planning to use the company’s patent portfolio in energy-efficient technologies. On October 24, 2007, Transmeta announced an agreement to settle its lawsuit against Intel Corporation. Intel agreed to pay $150 million upfront and $20 million per year for five years to Transmeta in addition to dropping its counterclaims against Transmeta. Transmeta also agreed to license several of its patents and assign a small portfolio of patents to Intel as part of the deal. Transmeta also agreed to never manufacture x86 compatible processors again. One significant sore point in the Intel litigation was the payout of approximately $34M to three of Transmeta's executives. In late 2008, Intel and Transmeta reached a further agreement to transfer the $20 million per year in one lump sum. On August 8, 2008, Transmeta announced that it had licensed its LongRun and low power chip technologies to Nvidia for a one time license fee of $25 million. On November 17, Transmeta announced the signing of a definitive agreement to be acquired by Novafora, a digital video processor company based in San Diego, California, for $255.6 million in cash, subject to adjustments dependent on working capital. The deal was finalized on January 28, 2009, when Novafora announced the completion of its acquisition of Transmeta. Due to financial troubles and inability to execute, Novafora collapsed in late July, 2009. Transmeta had a succession of 6 different chief executive officers who ran the company over its lifetime. Among its crew of technologists, Transmeta employed some of the industry's more public figures including Linus Torvalds, Hans Peter Anvin and Dave D. Taylor. Partially because of the presence of these figures, the industry was constantly abuzz with rumors and 'conspiracy theories' resulting in excellent press relations. 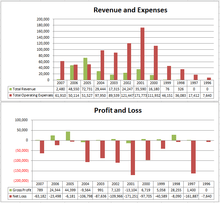 The following charts show the company's revenues, operating expenses, gross profits and net losses from 1996 through 2007. Numbers are in 1000s as per the 10-K reports. The company was once named as the Most important company in Silicon Valley in an Upside magazine editorial but failed to obtain profitability while it was a chip vendor. Crusoe was the first family of microprocessors from Transmeta, named after the literary character Robinson Crusoe. Transmeta lost much credibility and endured significant criticism due to the large discrepancies between projected performance and power consumption and the actual results. Although power consumption was somewhat better than Intel and AMD offerings, the end user experience (i.e. battery life) only showed a marginal overall improvement. First, the Code Morphing Software (CMS) combined with cache architecture artificially inflated comparisons between benchmarks and real-world applications. This is due to the repetitive nature of benchmarks and their small footprints. The CMS software overhead may have actually been a key cause of much lower performance for many real-world applications; the simple VLIW core architecture could not compete on computationally intensive applications; and the southbridge interface was limited by its low bandwidth for graphics or other I/O-intensive applications. Some standard benchmarks even failed to run, throwing the claim of full x86 compatibility into doubt. The Efficeon processor was Transmeta's second-generation 256-bit VLIW processor design. Like the Crusoe (a 128-bit VLIW architecture), Efficeon stressed computational efficiency, low power consumption, and a low thermal footprint. A 2004-model 1.6-GHz Transmeta Efficeon (manufactured using a 90-nm process) had roughly the same performance and power characteristics as a 1.6-GHz Intel Atom from 2008 (manufactured using a 45-nm process). The Efficeon included an integrated Northbridge, while the competing Atom required an external Northbridge chip, reducing much of the Atom's power consumption benefits. The Transmeta Efficeon processor addressed many of Crusoe's shortcomings and showed roughly a 2x real-world improvement over Crusoe. Its die was considerably smaller than Pentium 4 and Pentium M, when compared in the same process technology. Efficeon's die fabricated in 90 nm is 68 mm², which is 60% of the Pentium 4 in 90 nm, at 112 mm², with both processors possessing a 1 MB L2 cache. The notion of selling a product into a specific thermal envelope was typically not understood by the mass of reviewers, who tended to compare Efficeon to the gamut of x86 microprocessors, regardless of power consumption or application. One such example of this criticism suggests the performance still significantly lagged behind Intel's Pentium M (Banias) and AMD's Mobile Athlon XP. The following is a list of third-party products that used Transmeta processors. Transmeta processors were in-order very long instruction word (VLIW) cores running a special dynamic binary translation software layer which together implemented compatibility with the x86 architecture. Transmeta trademarked the term "Code Morphing" to describe their technology and referred to the software layer as Code Morphing Software (CMS). Code Morphing Software consisted of an interpreter, a runtime system and a dynamic binary translator. x86 instructions were first interpreted one instruction at a time and profiled, then depending upon the frequency of execution and other heuristics, CMS would progressively generate more optimized translations. Similar technologies existed in the 1990s: Wabi for Solaris and Linux, FX!32 for Alpha and IA-32 EL for Itanium, open-source DAISY, the Mac 68K emulator for the PowerPC. The Transmeta approach set a much higher bar for x86 compatibility due to its ability to execute all x86 instructions from initial boot up to the latest multimedia instructions. As the market leaders Intel and/or AMD would extend the core x86 instruction set, Transmeta could quickly upgrade their product with a software upgrade rather than requiring a respin of their hardware. This method just emphasises the compatibility rather than the performance. Performance and power can be tuned in software to meet market needs. It would be relatively simple to fix hardware design or manufacturing flaws in the hardware using software workarounds. More time could be spent concentrating on enhancing the capabilities of the core or reducing its power consumption without worrying about 33 years of backward compatibility to the x86 architecture. Prior to Crusoe's release, rumors indicated Transmeta was relying on these benefits to develop a hybrid PowerPC and x86 processor. But Transmeta would initially concentrate solely on the extremely low-power x86 market. The ability to quickly update products without a hardware respin was demonstrated in 2002 with an in-the-field upgrade (a download) to enhance CPU performance of the Crusoe based HP Compaq TC1000 tablet PC. It was used again in 2004 when NX bit and SSE3 support were added to the Transmeta Efficeon product line without requiring hardware changes. In the field upgrades were rare in practice due to system hardware vendors not wanting to incur additional customer support costs or spend additional money on QA for the potential upgrades or bug fixes to shipped products they had already closed the revenue books on. In conjunction with its code-morphing software the Efficeon most closely mirrors the feature set of Intel Pentium 4 processors, although, like AMD Opteron processors, it supports a fully integrated memory controller, a HyperTransport IO bus, and the NX bit, or no-execute x86 extension to PAE mode. NX bit support is available starting with CMS version 6.0.4. Efficeon's computational performance relative to mobile CPUs like the Intel Pentium M is thought to be lower, although little appears to be published about the relative performance of these competing processors. Efficeon came in two package types: a 783- and a 592-contact ball grid array. Its power consumption was moderate (with some consuming as little as 3 watts at 1 GHz and 7 watts at 1.5 GHz), so it could be passively cooled. Two generations of this chip were produced. The first generation (TM8600) was manufactured using a TSMC 130 nm process and produced at speeds up to 1.1 GHz. The second generation (TM8800 and TM8820) was manufactured using a Fujitsu 90 nm process and produced at speeds ranging from 1 GHz to 1.7 GHz. Internally, the Efficeon had two arithmetic logic units, two load/store/add units, two execute units, two floating-point/MMX/SSE/SSE2 units, one branch prediction unit, one alias unit, and one control unit. The VLIW core could execute a 256-bit VLIW instruction per cycle. A VLIW is called a molecule and has room to store eight 32-bit instructions (called atoms) per cycle. The Efficeon had a 128-KB L1 instruction cache, a 64-KB L1 data cache and a 1-MB L2 cache. All caches were on die. Additionally, Efficeon code morphing software (CMS) reserved a small portion of main memory (typically 32 MB) for its cache of dynamically translated x86 instructions. The native crusoe code – even if it was documented and available – is not very conducive to general-purpose OS stuff. It has no notion of memory protection, and there's no MMU for code accesses, so things like kernel modules simply wouldn't work. The translations are usually better than statically compiled native code (because the whole CPU is designed for speculation, and the static compilers don't know how to do that), and thus going to native mode is not necessarily a performance improvement. So no, it wouldn't really benefit from it, not to mention that it's not even an option since Transmeta has never released enough details to do it anyway. Largely for simple security concerns – if you start giving interfaces for mucking around with the "microcode", you could do some really nasty things. […I meant…] "you cannot do that". And we won't even tell the details of how you cannot do that. In fact, even inside transmeta you cannot do that, without having a specially blessed version of the flash that allows upgrades. If you ever see a machine with a prominent notice saying "CMS upgraded to development version", then that's a hint that it's a machine that TMTA developers could change. Subsequent "clean room" reverse engineering, published in 2004, clarifies some details of the native VLIW architecture and associated instruction set, and suggests that there are fundamental limitations that preclude porting an operating system such as Linux to it. The same work also compares Transmeta's patented technology with prior art published and in some cases patented by IBM, and suggests that some claims might not stand detailed scrutiny. 1 2 3 4 "Transmeta Corporation 10-K". Securities and Exchange Commission. 2007. ↑ "Company Profile for Transmeta Corp (TMTA)". Retrieved October 3, 2008. 1 2 3 4 5 6 "The Technology Behind Crusoe Processors, Transmeta Corporation" (PDF). Web.archive.org. January 19, 2001. Archived from the original (PDF) on 2001-01-19. Retrieved November 13, 2011. 1 2 3 4 David R. Ditzel (June 21, 2008). Experiences with Dynamic Binary Translation (ISCA AMAS-BT Workshop Keynote) (PDF). ISCA 2008. 1 2 3 4 James C. Dehnert; Brian K. Grant; John P. Banning; Richard Johnson; Thomas Kistler; Alexander Klaiber; Jim Mattson (March 27, 2003). The Transmeta Code Morphing Software: Using Speculation, Recovery, and Adaptive Retranslation to Address Real-Life Challenges. CGO 2003. ↑ Vance, Ashlee (September 21, 2007). "Semi-Coherent Computing Episode 7 – Podcast – Chip pioneer David Ditzel talks Transmeta, Sun and Bell Labs". Theregister.co.uk. Retrieved November 13, 2011. ↑ Geppert, Linda; Perry, Tekla (May 2000). "Transmeta's Magic Show". IEEE Spectrum. IEEE. 37 (5): 26–33. doi:10.1109/6.842131. 1 2 "Sony licenses Transmeta power-saving technology: Chipmaker looks to licensing to reach profitability". January 24, 2005. 1 2 "Transmeta Quits Microprocessor Business: Transmeta to Focus on IP Licensing". X-bit labs. February 2, 2007. Retrieved November 13, 2011. ↑ "Transmeta Corporation 8-K". Securities and Exchange Commission. January 28, 2009. ↑ "Acquires Transmeta Patent Portfolio". Intellectual Ventures. 2009-01-28. Retrieved 2014-03-03. 1 2 "Transmeta Corporation – Transmeta Announces Settlement of Patent Litigation, Technology Transfer and License Agreement with Intel". Investor.transmeta.com. Retrieved November 13, 2011. 1 2 Crothers, Brooke (August 7, 2008). "Transmeta licenses low-power tech to Nvidia". News.cnet.com. Retrieved November 13, 2011. ↑ "Transmeta licences low-power tech to Sony". ↑ "Fujitsu licenses Transmeta's LongRun tech". ↑ "NEC licenses Transmeta technology, takes stake in company". ↑ "Transmeta Corporation – Transmeta Breaks the Silence, Unveils Smart Processor to Revolutionize Mobile Internet Computing". Investor.transmeta.com. Retrieved November 13, 2011. ↑ "TIME Magazine – Asia Edition – March 31, 2008 Vol. 171, No. 12". Asiaweek.com. May 9, 2011. Retrieved November 13, 2011. ↑ "Transmeta Details Continue to Unravel". Hardware.slashdot.org. Retrieved November 13, 2011. ↑ "A New CPU? – Shacknews – PC Games, PlayStation, Xbox 360 and Wii video game news, previews and downloads". Shacknews. Retrieved November 13, 2011. ↑ "Transmeta CPU takes on Pentium". 1 2 "VHJ: Tracking Transmeta". Vanshardware.com. July 15, 2003. Retrieved November 13, 2011. ↑ "Transmeta to cut 200 as losses deepen - CNET News.com". News.com.com. July 18, 2002. Archived from the original on July 13, 2012. Retrieved November 13, 2011. ↑ "AMD To Provide Transmeta Efficeon Microprocessor Supporting Microsoft FlexGo Technology In Emerging Markets". Investor.transmeta.com. Retrieved November 13, 2011. ↑ "AMD invests $7.5 million in Transmeta - CNET News.com". News.com.com. Archived from the original on July 16, 2012. Retrieved November 13, 2011. ↑ "Angry investor offers to buy Transmeta". The Register. February 1, 2008. ↑ "Transmeta Corporation Schedule 14A". Securities and Exchange Commission. August 25, 2008. pp. 19–20. 1 2 Ina Fried (November 17, 2008). "Transmeta finds a buyer". cnet.com. ↑ "Novafora Sells Off Certain Transmeta's Patents at the Day of Completion of Acquisition". xbitlabs.com. Retrieved November 13, 2011. ↑ "Intellectual Venture Funding LLC". Intellectualventures.com. Retrieved November 13, 2011. ↑ "Transmeta buyer Novafora goes under, says report". EE Times. Retrieved 2014-03-03. ↑ "Transmeta Corporation 10-K". Securities and Exchange Commission. 2000. ↑ "Transmeta Corporation 10-K". Securities and Exchange Commission. 2005. ↑ "Tom's Hardware: Performance estimates: Almost a Pentium M at a fraction of the power". Tomshardware.com. April 1, 2008. Retrieved November 13, 2011. ↑ "VHJ: Benchmarking Transmeta's efficeon". Vanshardware.com. April 4, 2004. Retrieved November 13, 2011. ↑ Manfred Dietrich; Joachim Haase (2011). Process Variations and Probabilistic Integrated Circuit Design. Springer. p. 185. ISBN 978-1-4419-6621-6. ↑ "DAISY: Dynamically Architected Instruction Set from Yorktown". Research.ibm.com. Retrieved November 13, 2011. ↑ "Linus Torvalds writing in the linux-kernel mailing list". Marc.info. June 20, 2003. Retrieved November 13, 2011. ↑ Real World Technologies. "Real World Technologies – Crusoe Exposed: Reverse Engineering the Transmeta TM5xxx Architecture I". Realworldtech.com. Retrieved November 13, 2011. 1 2 Real World Technologies (January 27, 2004). "Real World Technologies – Crusoe Exposed: Reverse Engineering the Transmeta TM5xxx Architecture II". Realworldtech.com. Retrieved November 13, 2011.